Mighty warriors renowned for their strength and inhuman stamina, barbarians often wander far from their homelands, hoping to heap glory on their names through brave deeds and feats of arms. Some are grim and silent, some jovial and friendly, others crude, gruff and arrogant. All barbarians see themselves as superior to the other men of the world, the rightful owners of anything they can take by force, and bound to a destiny written down before time began. Coupled with their physical toughness, their belief in predestination leaves them unafraid of death, and thus all the more fearsome in battle. 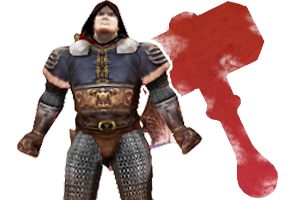 The Barbarian is a powerhouse class that is second to none in melee damage. Their key power, and what fuels a Barbarian during his slaughtering spree, is Battle Rage. Though their class powers are few, they have access to high-ranking powers for lots of different weapons, which vary their playstyle greatly. The Barbarian can shrug off damage and crowd control effects while barreling down on their target with a frightening tenacity. The two base classes for the Barbarian have the same overall goal of staying within attack range of their target as long as possible; however, their methods of doing so vary drastically. The race of your character has a lot more weight for this class as the available races stats, powers, and disciplines can give additional utility or allow one to double-down on damage. Battle Rage's healing component gives it excellent tactical applications. Maybe it's best to use it early to burst down a high-priority target or maybe it's better to use it later in the fight for a second wind. Auto-running when you attack someone will only move you to your weapon's max range. For moving targets, it is better to run next to them and then use the attack command. This gives your character more time to execute the attack animation. Look through the weapon powers for Barbarian's available weapons to figure out what kind of utility you want in a fight. 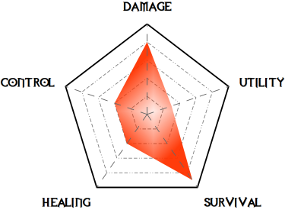 Each weapon has different advantages and disadvantages. Because of the defensive penalty for Battle Rage, this is one of the few Rogue-based prestige classes that it is recommended to not attempt a high defense build. Instead, focus on dodge and resistance enchantments. Although you lack Black Mask, your damage is still far and away higher than any other Rogue. If you can get past their defense you should win most fights. Shout does not have a hitroll, so use that to negate passive defense on targets you are having issues attacking. This page has been accessed 151,450 times.